Words and pics courtesy of Hotrodmattimages.com – Thanks dude! Western Sydney Rollers hosted their first home inter-league bout on Saturday 16, October 2010. 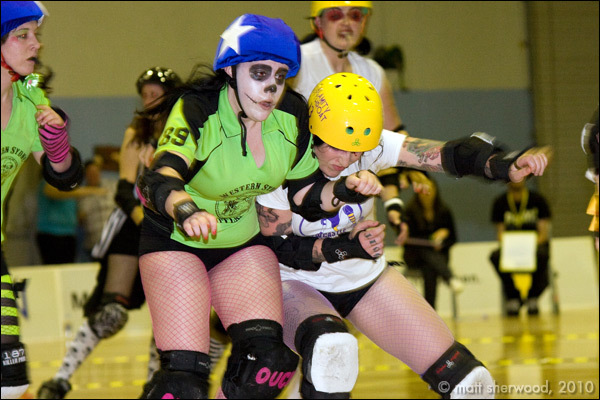 The bout was seasonally themed for Halloween. Needless to say, the Derby gals weren’t the only ones sporting bruises (or worse). With a good crowd of local supporters and Newcastle’s traveling fans the Nepean Valley Sports Stadium hummed with anticipation while skaters warmed up on the flat track. 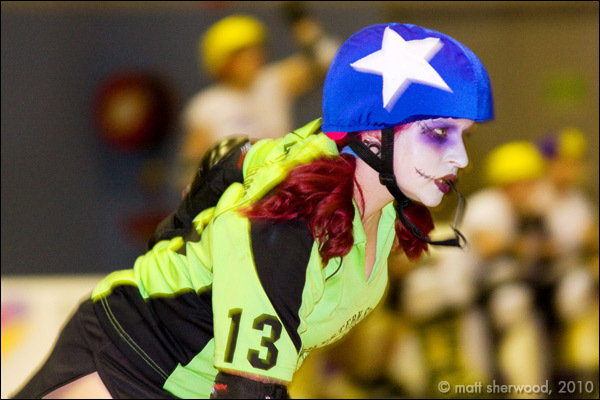 Mal Adjusted focused the crowd’s attention, introducing the Newcastle Roller Derby League’s Dockyard Dames to the track. Then, in keeping with the theme, the WSR Team, The Western Sydney Boutlaws, entered the rink, dropping like corpses only to be awoken as living dead by the voodoo necromancy of Pollywanna Hackher. The home team put on a good showing but were under pressure early from the Newcastle skaters. The formidable GodJilla regularly decimating the efforts of the Western Sydney jammers, making it hard for WSR to catch up to NRDL’s early lead. Half time entertainment was provided by Blast Wrestling. Imagine a bunch of furies meeting rock ‘n’ roll wrestling… The kids in the audience loved it. 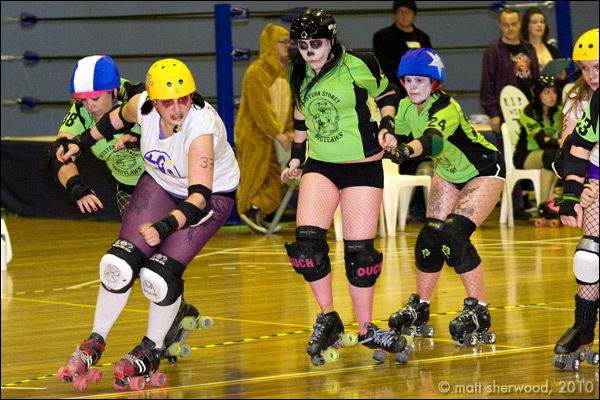 Returning for the second half saw the NRDL with a healthy lead, but WSR supporters still had hopes for their team with explosive jammers such as Lady Fairyfloss , Lil’ Miss Irish and D’Star-Uction surely with something still up their sleeves. Even with some good scoring jams from WSR President, Max Manic and the other jammers, the experience of the Newcastle team was just to strong on the night and they took the win with a final score of 121 – 38. Despite the loss the WSR girls are showing fine form and continual improvement… Support roller derby and support the Western Sydney Rollers! For the full gallery of pics, check out hotrodmatt’s website by clicking here. Outstanding! Wish I was there for that!! 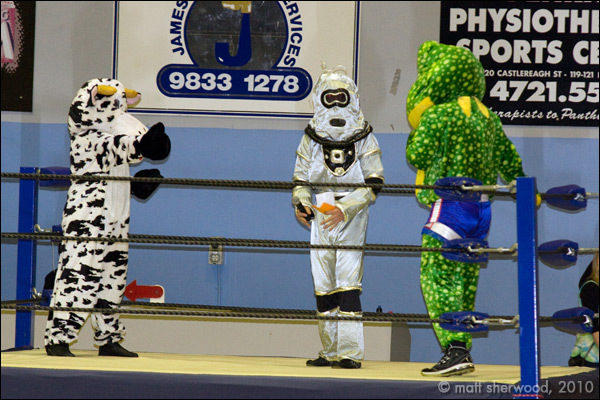 Surrealist roller racing + animal suit boxing- Yep, Im there!